Bogbean (Menyanthes Trifoliata) other names: Buckbean, Herbe à Canards, Marsh Trefoil, Ményanthe, Ményanthe Trèfle d’Eau, Ményanthe Trifolié, Ményanthe à Trois Feuilles, Menyanthes, Menyanthes trifoliata, Trébol de Rio, Trèfle d'Eau, Trèfle d’Eau Commun, Trèfle des Marais, Water Shamrock. 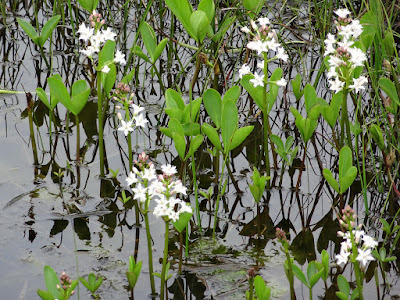 Bogbean (botanical name, Menyanthes trifoliata L.) is an aquatic or semi-aquatic plant, often found growing in soft wet lands, and, hence, its common name. While ‘bog' means a marshy land, ‘bean' in the plant's name denotes the even-edged glossy leaves which have some resemblance to the appearance of the young broad beans. Since, each leaf of the bogbean is split into three leaflets, the plant's specific name is derived from the Latin word ‘trifoliata', which means three leaves. Characteristically, the leaves as well as the flowers of bogbean appear above the water level, growing from a crawling storage part of the plant akin to a root and called ‘rhizomes'. The flower stalk of bogbean is smooth and may grow up to a height of 30 cm and each flower stalk bears several subtle, fluffy flowers that have resemblance to stars having a pinkish colour on the external side of the petals. The bogbean is also known as ‘bog hop' and this aquatic plant obtained this alternative common name owing to the use of its leaves in the form of a flavoring agent in making beer. 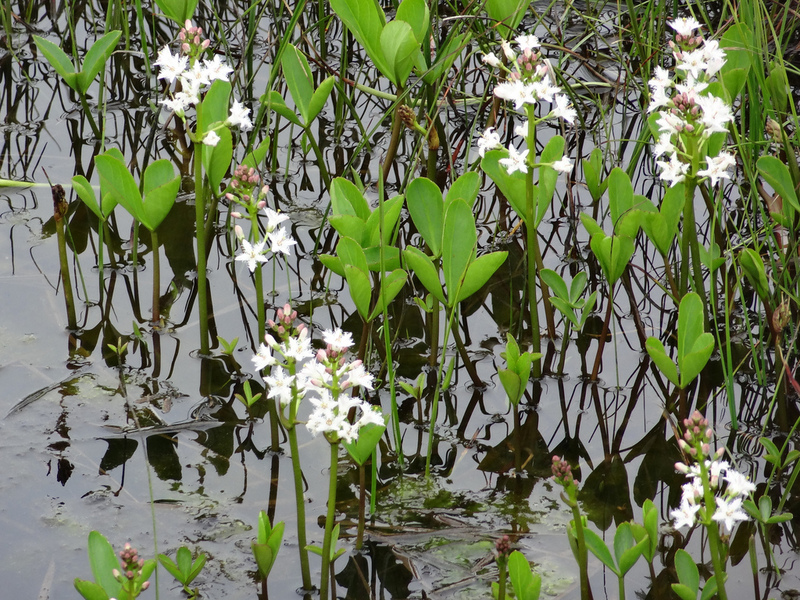 It may be noted that only bees find easy accesses to bogbean, since bogbean generally grows in swamps and marshlands that are virtually inaccessible as well as in cold water. In effect, people who come across bogbean growing in the wild are generally fortunate and can never mistake this species for any other herb, since bogbean is amongst the most attractive and striking aquatic plants. When the bogbean flowers are in the phase of buds, they have a subtle whitish-pink hue and when the petals open completely, the flowers of bogbean are swathed by a supple white color fluff or tassel. Humans have held bogbean in high esteem since ages owing to the gorgeousness of its flowers. In addition, the leaves of the bogbean, which enclose substances that are potently bitter to taste, were used in the form of an herbal medication. In earlier times, physicians in Europe employed bogbean leaves in the form of a cathartic as well as a medication to cure fevers, constipation, scabies, scurvy, rheumatism and dropsy (formerly known as edema or an anomalous fluid build up inside the body tissues). In addition, bogbean was also reputed for being a useful tonic and for promoting appetite. European settlers who established colonies in America discovered bogbean growing in nature and employed it to the fullest extent like they did in their native lands. 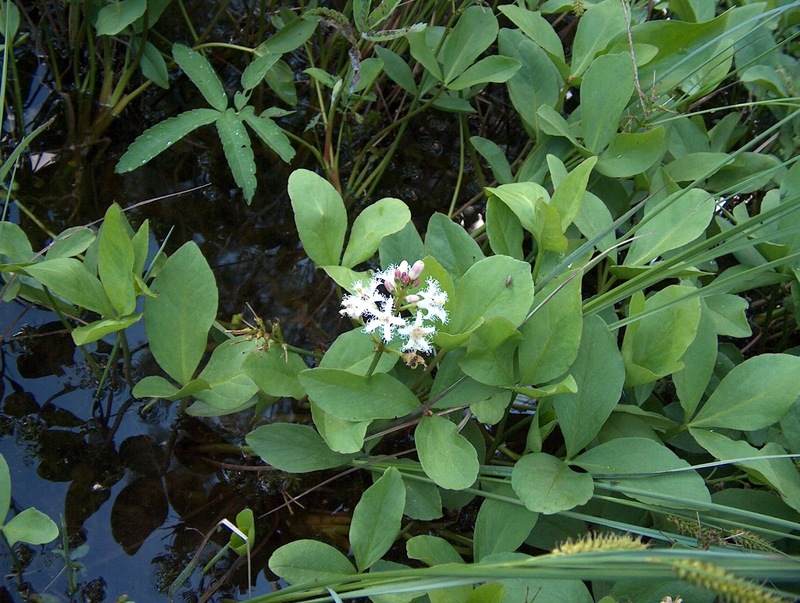 A number of native Indian tribes in America boiled the rhizome of bogbean in water to prepare a decoction and used it to cure spitting blood as well as different other internal medical conditions. They also used this aquatic herb to cure jaundice, skin complaints as well as to flush out parasitic intestinal worms. Bogbean is indigenous to Europe and North America, where it is found growing from Labrador to Alaska in the north and southwards to West Virginia and extending to Wyoming. In some states of the US, this species has become rare or turned into an endangered species. Bogbean needs to be grown in wet land in a semi-aquatic garden where the soil is swampy or in low water along the sides of a pond. This species has a preference for acidic conditions and thrives well in water that is at the most 30 cm deep. Bogbean loathes shade and the plants of this species may turn out to be extremely invasive as they spread very rapidly through their long crawling thick rhizomes. Bogbean is basically an extremely resilient herb that has the aptitude to endure temperatures as low as -25°C. Interestingly enough, it has been found that this herb is a favourite of the cats. Bogbean is an intensely bitter herb which helps to promote appetite as well as invigorates the secretion of digestive juices. Bogbean is generally taken to enhance a weak or dysfunctional digestion, especially if the patient also experiences uneasiness in the abdominal region. In addition, bogbean is also used to facilitate weight gain and is considered to be a useful natural medication for treating rheumatoid arthritis, particularly when this malady is related to debility, weight loss and absence of vigour. Generally, herbalists prescribe bogbean in conjugation with other herbs, for instance white willow and celery seed. It may be noted that bogbean has intimate relation with gentians that are well-known bitter herbs employed in the form of a digestive as well as a common body tonic. This herb too may be used in the same way, but it may cause irritation to the digestive system, especially if the patient is enduring gastric infection or inflammation. Bogbean possesses astringent, anti-inflammatory, carminative (a medication that eases flatulence), digestive, cathartic, diuretic, deobstruent (a medication that helps to remove obstructions), emetic, febrifuge, emmenagogue (a medication that promotes menstrual discharge), stomachic, hypnotic and tonic attributes. Every part of bogbean plant is therapeutically active, but the leaves are used most frequently. It is best to collect the leaves of this aquatic plant in the later part of spring or early part summer and dried out prior to use. Using the fresh leaves may result in vomiting. An infusion prepared with the leaves of bogbean is used to treat muscular debility in M.E., persistent infections accompanied with weakness and fatigue, anorexia (inability to eat), indigestion and rheumatism. When this infusion is given in minor doses of 10 grains it enhances vitality of the stomach and facilitates in digestion. Patients suffering from dysentery, diarrhea or colitis should avoid this herb. In addition, taking the herb in excessive doses may result in vomiting. The rhizomes of bogbean are edible and cooked before consumption. However, the roots need to be treated with a view to eliminate its pungent (acrid) taste. The acrid taste may be got rid of by dehydrating the root, pulverizing into a powdered form and subsequently rinsing it under running water. However, it is unfortunate that in addition to the acrid flavour, this process also deprives the roots much of its vitamin and mineral content. The powder prepared from bogbean roots may be used to make ‘missen bread' (also known as famine bread). 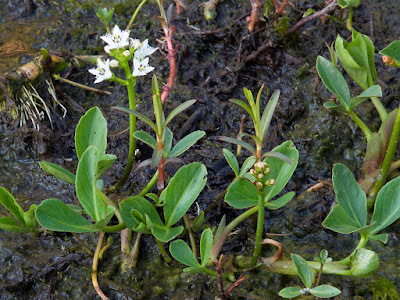 In effect, the root of this aquatic plant is an emergency food, which is used when there is nothing edible available. The leaves of bogbean are extremely bitter and are employed in the form of a substitute in the beer making process. Bogbean is safe in food amounts and might be safe for most people when used in medicinal amounts. However, bogbean might be unsafe in large quantities. Bogbean can irritate the stomach and intestines and cause diarrhea, pain, nausea, and vomiting. Surgery: Bogbean can slow down the clotting process. Bogbean might increase the risk of bleeding during and after surgery. Stop using bogbean at least two weeks before a scheduled surgery.